Studying at LSE has been a process of challenging myself intellectually. I already spoke in previous posts about my struggle to find myself academically during my undergraduate studies. I think that the main difference when you start your master’s level degree – and this is truer when you’ve already had time to think about what you want to do – is that you are able to approach academia with more ownership and you have more freedom to think about what you really want to investigate. In this post I will speak of some of the ups and downs that I went through when designing my dissertation research and how this was related to this discovery process. I often look back to myself in September and I am very impressed by how far I have come and how much I have changed in terms of academic interests. When I arrived here, I was interested in everything and nothing at the same time. I wanted to study development, governance, data, economics… And essay after essay, lecture after lecture I started to shape my interests and, more importantly, I learned that there were people out there who were writing about the things I am interested in. In September, the word “dissertation” caused me nausea. I was excited at the idea of doing my masters, but ignoring the fact that I had to write my dissertation. I think that in truth I was really afraid of it, mainly because I was afraid that LSE would be too hard, too academic, too demanding. It wasn’t. And now, nine months later, it’s one month to go and I can safely say that it has been one of the most interesting projects I have ever been involved with. First, let me say that I had never conducted research before. I didn’t have to do an undergrad dissertation and I had never led such a demanding project. Also, I am not one of those people who knows the name of every academic and seems to have been born inside a university classroom. I did things my own way and I have no idea whether this is what a successful dissertation is supposed to be like. I don’t think I will go for a PhD afterwards and I am generally more interested in the scavenger hunt-like process of it all. I am an OK student. We had to submit the topic of our dissertation and our choice of supervisor in the last week of the Michaelmas Term. As the deadline was approaching, most of us were faced with the truth; we had no idea what we would write in that online form. That was what I am passionate about right there. It mixes political economy, psychology, Foucault, all in one go. I started to work on that. Lent Term was a much less structured trimester in comparison to Michaelmas, we didn’t have core classes anymore and I had 3 completely empty days. Self-discipline was key to make it until April. I had already learned something about myself though; if my last lecture of the week is on Thursday morning, it is very hard for me to concentrate on doing the following week’s readings in advance on Thursday afternoon and Friday, these days are generally lost. I made two executive decisions; for the duration of the term, every Thursday afternoon was declared “Career Thursday” in which I would search for career resources. Fridays were declared “Dissertation Fridays” and were fully dedicated to thinking about my dissertation. They easily became my favourite day of the week. It was a long process, a lot of it was dedicated to shaping a research question, finding the concepts that I needed, thinking about how to investigate the topic. I kept a notebook through which I can easily track the progress; the moment in which I started thinking about methods, the little illustrations with nerdy references that helped me pretend that I was not procrastinating. My first idea involved walking. I wanted to ask programmers what data could be drawn out of someone walking. It seemed childish in a way, but it involves so many important concepts: data generated from individual behaviour through sensors placed in mobile phones and wearables, and the social and communicative affordances that you can make of this data – (See Nagy and Neff, 2015). The final idea is to investigate how big data is created and how it relates to economic and political relations in the perspective of data scientists. 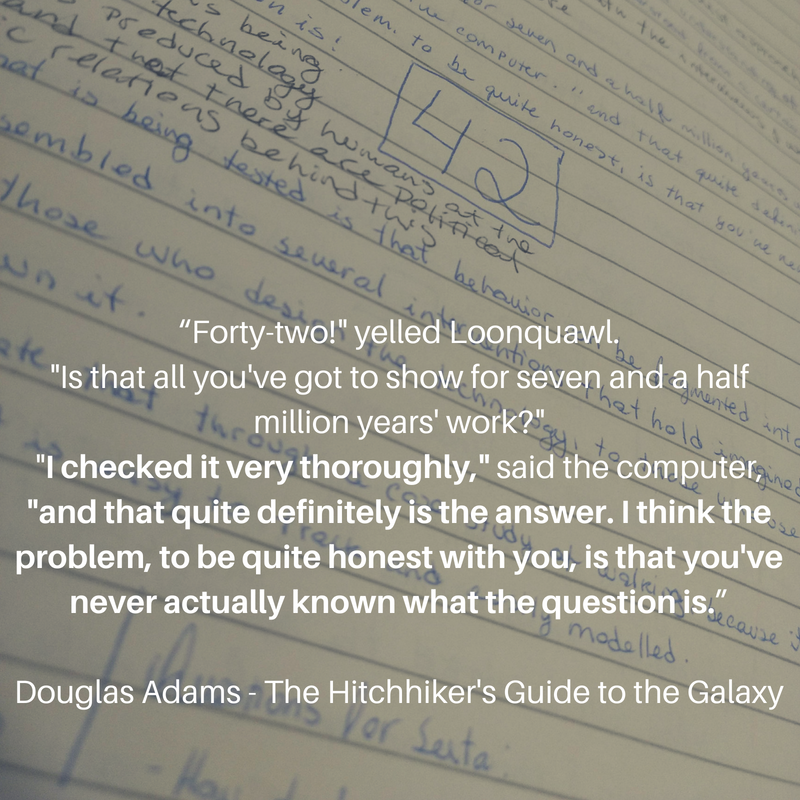 I wrote this reference to Douglas Adams in my notebook back in February, and to be honest, it very much defines most of the process: I often feel like I am trying to find the answer to all the problems in the universe, which will most likely produce a result as random as 42. On my wall, I built a diagram with the whole treasure map that I was trying to explain. I might, or might not have claimed once that this research is my Mona Lisa. Now we are exactly one month away from the deadline. On my next post, I will speak about the challenges in conducting and obtaining the interviews that I need for the project and the things that this taught me about myself. But let me just say that, as I start to see the light at the end of the tunnel, I look back at the process of inventing my dissertation and I am very proud of it. I am not sure what it will be in the end, I see now that it has some structural problems that I simply don’t know if I can solve, and I might just be insisting on an idea that is too broad and too complicated. But I am proud of how far I have come in terms of developing myself academically and how much I have learned along the way.